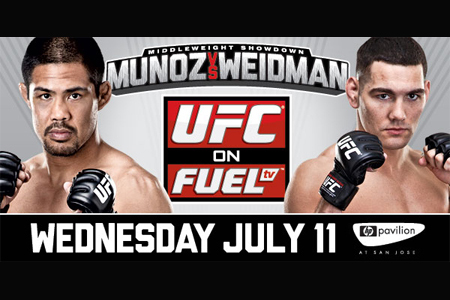 Tonight Al Iaquinta’s Serra Longo teammate Chris Weidman will take on Mark Munoz in the main event of UFC on Fuel 4. For those of you who may not know Weidman he’s been extremely impressive going 4-0 in his first four fights in the UFC(8-0 professionally overall). Weidman defeated Alessio Sakara in his UFC debut, Jesse Bongfeldt, Tom Lawlor, and most recently a big unanimous decision win over Demian Maia, a fight Weidman took on two weeks notice. Weidman was also the Ring of Combat middle weight champion. Chris, originally from Baldwin New York has a strong wrestling background. His resume is an impressive one. Weidman is a two-time Junior College All-American, two-time Division 1 All-American at Hofstra, NYS High School Wrestling Champion, 2007 CAA Wrestling Champion, NYS College Wrestling Champion, as well as a Grapplers Quest Absolute Division Champion, and a US Brazilian Jiu-Jitsu Champion. Make sure you tune into FUEL tonight at 8PM and support Chris in his fight against Mark Munoz. Here’s Al taking a little bit about his Serra Longo teammate. Tell us a little bit about Chris Weidman, and any training experience you’ve had with him. He’s an amazing athlete, the guys a freak. He picked up the sport so fast, he’s a quick learner. I think his wrestling speaks for itself, but people still haven’t seen how impressive his stand up is. Why do you think Chris has been so successful so far in his UFC career? Chris is really strong mentally, and is always working hard. He took that fight against Demian Maia on short notice and went in and got a win. Once he has his mind set on a goal nothing’s going to stop him. What’s the key to Chris beating an opponent like Munoz who is also a great wrestler? It’s tough to say, you could see both guys look to stand throughout the fight. I think if they do Weidman has a big advantage in his stand up. If the fight goes to the ground I think Chris will surprise a lot of people. Any factor that the fight is going to be five rounds? I don’t think that’s going to be an issue. If anything the longer fight will benefit Weidman. He has great cardio, which will be a big advantage if the fight goes to the later rounds. What do you think a win could mean for Weidman at this point? Can you put him in the conversation to fight Anderson Silva? I think if he wins the fight and takes out Munoz , and wins it in spectacular fashion he definitely deserves a shot at Silva. Congrats has to go out to another teammate of yours Constantinos Phillippou on his victory this weekend over Riki Fukuda at UFC 148. What are your thoughts on that? A great fight, Costa fought really well. With four wins in a row now, he’s definitely ready for the higher ranks. I’m excited to find out who he’s going to fight next. When you see your teammates doing so well does that give you the itch to get back in there as soon as you can and do the same? Absolutely, seeing everyone do well gets me motivated to get back in there. I’m looking forward to fighting again as soon as possible.